Update November 2014. During the summer of 2014 considerable work has been undertaken to clear the well. In addition a slate plaque has been attached beside the site, making it much easier to find. In 2012 on our first visit the well was completely overgrown and very difficult to find – the post below reflects that in describing our problems in finding it. The original photographs, which were mostly of weeds and long grass have been largely replaced by new ones showing the well as we found it in November 2014. 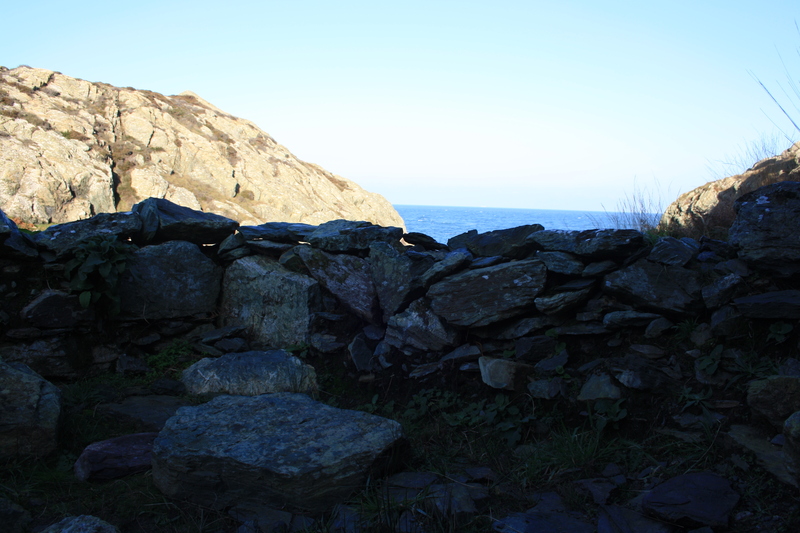 We had walked a mile or so along the cliff tops from Porth Eilian on the North East coast of Anglesey, in search of St Elian’s Well. Not having a good description with us we had investigated a couple of possible, though unlikely, candidates before resting and having a picnic beside a fast running stream flowing into the sea at a gap in the cliffs. Deciding by that stage that we had clearly missed the well, we returned to Llaneilian to visit the church. There, chatting to a very helpful couple, who were tidying the church, made us realise that we had actually eaten our picnic virtually beside the well, although it was so overgrown that you would never have noticed it otherwise. A finger post points from the church towards the well, a more direct route than along the coastal path so we returned to find the site. There are no early records of Elian’s life, most accounts were first written in the middle ages. It is said that Elian came to Wales from Rome, arriving in the fifth century with oxen and other animals, landing on the Anglesey coast to start a mission. Caswallon, the local lord, father of Maelgwn Gwynedd, offered him land on which to establish a church. His generosity extended to granting an area to be determined by the distance Eilian’s pet doe could cover in a day. Unfortunately whilst the doe was measuring out the land it was attacked and killed by a greyhound. Elian was so upset that he immediately cursed the place such that no man would be able to keep a greyhound on that land ever again. 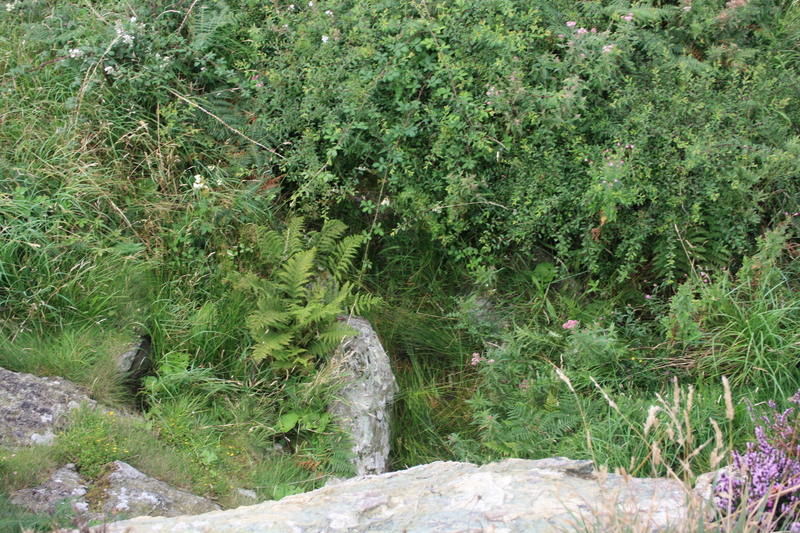 Eilian’s well, Ffynnon Eilian, is at the foot of a rocky outcrop close to the sea. Water emerges from a cleft at the base of the rock. In August the area was extremely overgrown, and the layout of the ground was difficult to see. It appears that the water flows away from the source in a stone lined channel towards the nearby stream. Further stone marks the base of a small chapel that once surrounded the well. The rock formed the back wall and three other walls enclosed it with an area of some six yards by four yards. Eilian’s well was very well visited as a healing well for many years. It had the advantage of requiring that a financial donation (usually a groat) was made for a cure to work, and the parish grew wealthy on the payments from pilgrims. A chest, dating from the early seventeenth century, Cyff Elian can still be seen in the church into which groats were placed. It was opened annually and apparently yielded sums of the order of 300 pounds a year. Two farms were purchased with the proceeds which supported the church. Latterly proceeds from the chest were distributed to the poor. On the eve of the saint’s day pilgrims seeking a cure would first drink from the well and then kneel before the altar in the well chapel. They would then progress to the church where further rituals took place. Here they would make offerings for the health of their oxen and cattle and for cures for ague, fits and scrofula. Further customs surrounded pilgrimages to Llaneilian. Wakes were held in August, originally on each of the first three Fridays. In the church is the remains of Elian’s shrine. An oak construction, formerly a box though now just its skeleton, semicircular, some six feet long, three feet wide and four feet high. Parishioners would take turns in crawling inside the box, once inside they would turn around three times and then crawl out again. Those who could successfully complete the task were guaranteed a healthy life for the coming year, those who couldn’t may not expect to live until the next festival. These two pictures are a before and after comparison, the one above taken in 2012, the one below in 2014 from roughly the same spot on the cliff top above the spring. Later the well developed a reputation as a cursing well. 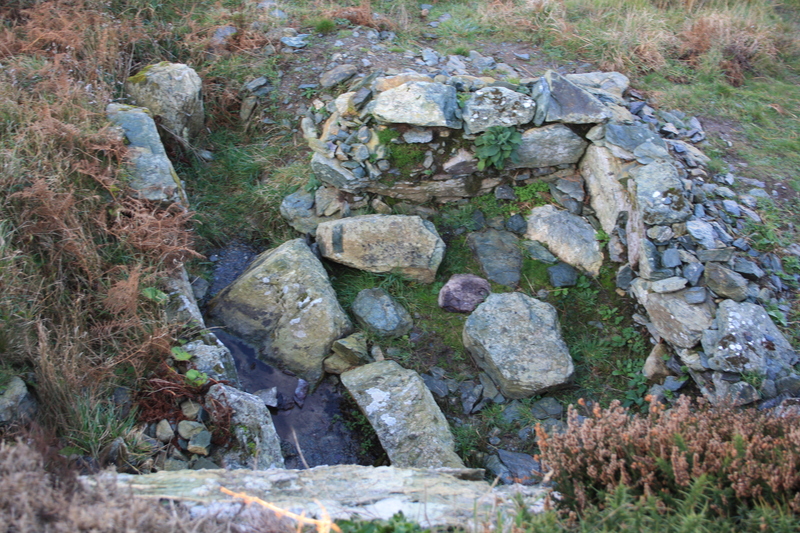 A number of such wells exist in the region, the most famous now being another Ffynnon Elian near Conwy. A number of cursing rituals grew up. Most commonly at this location the would be curser paid the well custodian to engrave the name or initials on a slate with a pin, the pin would then be bent and thrown into the well. The typical witch’s method of making a dummy of the person to be cursed and piercing of drowning the dummy were also carried out. Such a marked slate and dummy were found close to the well in 1925 and are now in the museum at Bangor. While for those who preferred a more gruesome approach, it has been recorded that a live frog was pierced with a skewer, to which was attached two corks. The frog was then floated on the water of the well and so long as the frog lived the person being cursed would suffer. Once again cursing was a very lucrative business, charges were levied both to place a curse and again to attempt to lift a curse. However in this case the monies were kept by the person who operated the well rather than by the church. 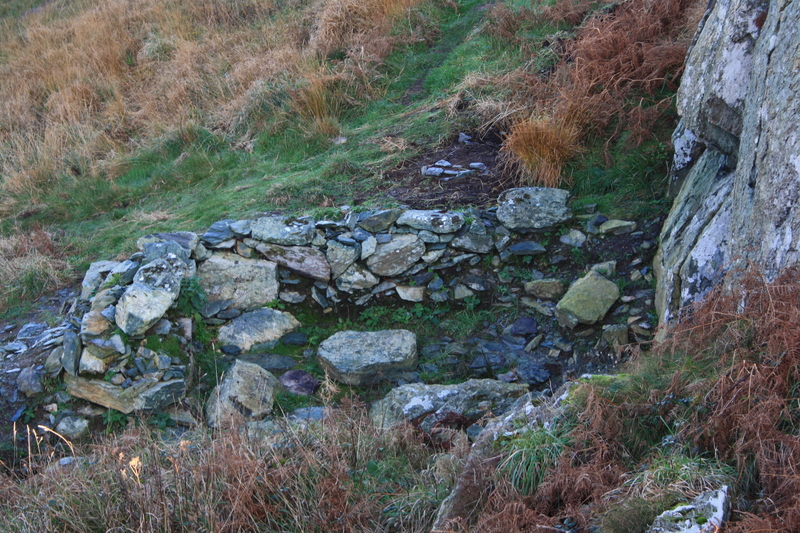 The well still retains its reputation, and has been known locally as the Witching Well. There is a local desire to have the well better marked for tourists. 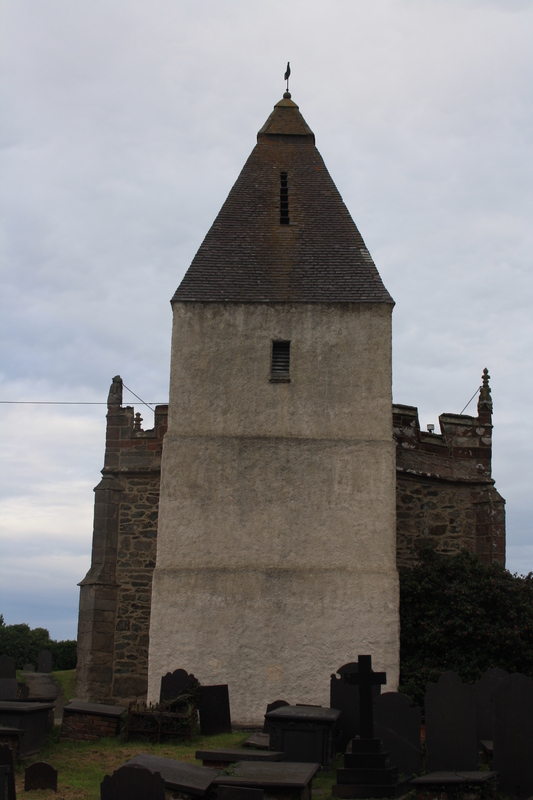 There is a signpost to it from the church, and inside the church there is an information sheet describing the well and the route to it. The people working in the church on our visit suggested they would like an engraved slate plaque (now there) to be fixed close to the well naming it and ensuring that casual visitors can better find it. The church at Llaneilian is one of the most impressive on Anglesey. The square lime washed tower dates from the twelfth century, the nave and chancel from the late fifteenth and early sixteenth centuries. There is an impressive rood screen bearing a painted skeleton demonstrating the transiency of life, and much fine sixteenth and seventeenth century carving. 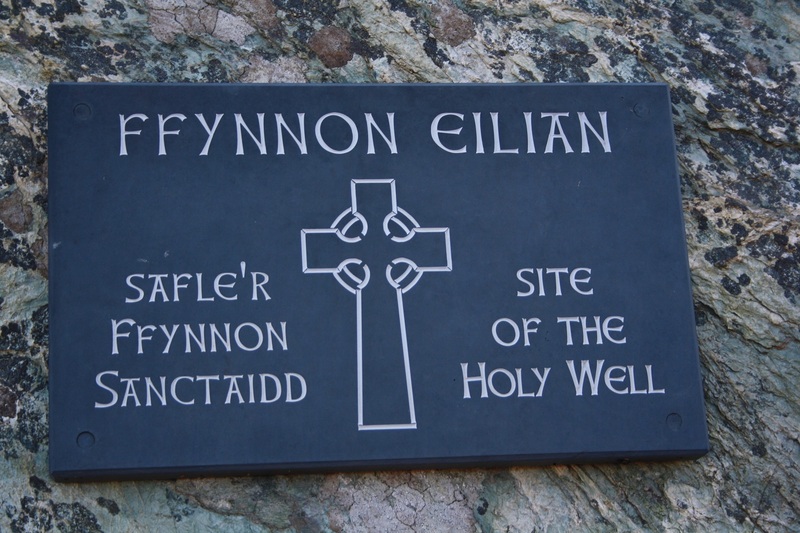 St Elian’s feast day falls on January 13 although the wakes at Llaneilian were held on Fridays in August. Janet Bord (1995) Cursing not Curing; The Darker Side of Holy Wells. Source The Holy Wells Journal. 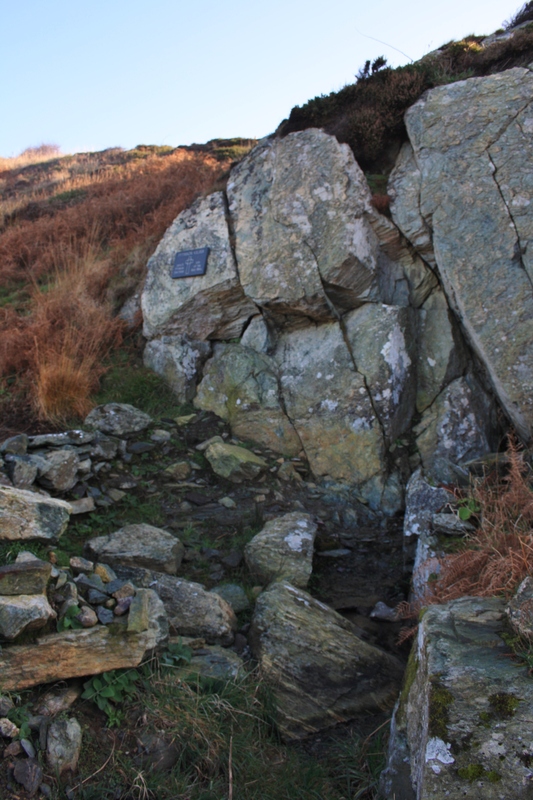 During 2014 the area around the Well will be cleared and a plaque attached to the rock face (which was one side of the enclosure).